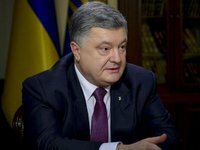 President of Ukraine Petro Poroshenko at a meeting in the Ukrainian House on Tuesday assured a group of hierarchs of the Ukrainian Orthodox Church (Moscow Patriarchate) that the state would protect the right of clergy and laity to free choice of church jurisdiction, presidential spokesman Svyatoslav Tsegolko has said. "He [the president of Ukraine] also said that the Ecumenical Patriarch, for his part, guarantees complete canonical protection for supporters of autocephaly in Ukraine," the presidential press secretary wrote on his Facebook page on Wednesday. Representatives of a group of hierarchs of the Ukrainian Orthodox Church (Moscow Patriarchate) supporting an appeal to the Ecumenical Patriarch of Constantinople regarding the granting of autocephaly met with the Ukrainian president at the Ukrainian House, he said. Poroshenko informed the hierarchs of his talks with Ecumenical Patriarch Bartholomew, of an agreement between Ukraine and the Constantinople Patriarchate, and the latter's willingness to facilitate the organization of a unifying assembly, Tsegolko said. "The bishops told the president about unprecedented pressure being put by Moscow on those bishops of the Ukrainian Orthodox Church (Moscow Patriarchate) who are willing to join the establishment of a unified church," he said. A meeting previously planned on Tuesday between Poroshenko and Ukrainian Orthodox Church top bishops was canceled. While an absolute majority of hierarchs of the canonical church gathered at the Kyiv Pechersk Lavra (Monastery of the Caves), where a conversation was expected to take place, Poroshenko changed his mind and did not arrive there but insisted that the hierarchs come to meet him at the Ukrainian House, which they refused to do. Poroshenko still met behind closed doors with some hierarchs of the Ukrainian Orthodox Church (Moscow Patriarchate) at the Ukrainian House on Tuesday evening.